Durable, Desktop MK120 brings comfort, style and USB simplicity together. 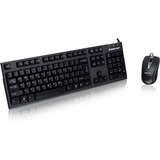 Desktop set includes a high-definition optical mouse and comfortable, quiet keyboard that's sleek and sturdy. Responsive mouse offers smooth cursor control with the high-definition optical tracking (1000 dpi). Low-profile keys on the keyboard barely make a sound. Standard layout includes a curved space bar, full-size F-keys and number pad. Thin profile keeps your hands in a more neutral position. Spill-resistant keyboard is designed to last with durable keys that can withstand up to 10 million keystrokes and sturdy, adjustable tilt legs. You can extend the sturdy folding legs to increase the keyboard tilt by 8 degrees to address your personal ergonomic needs. Plug-and-play design lets you plug your keyboard and mouse into USB ports on your desktop, laptop or netbook computer and start using them right out of the box. 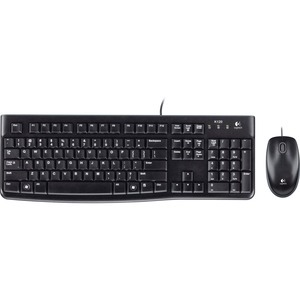 Keyboard and mouse are compatible with Windows XP, Windows Vista, and Windows 7.